Weather-resistant plastic. Cord included. UL listed. Straw not mcluded. · seph is 36-in. tall. Jesus is 16:Y.. in. long. Wood crib 21%in. long. 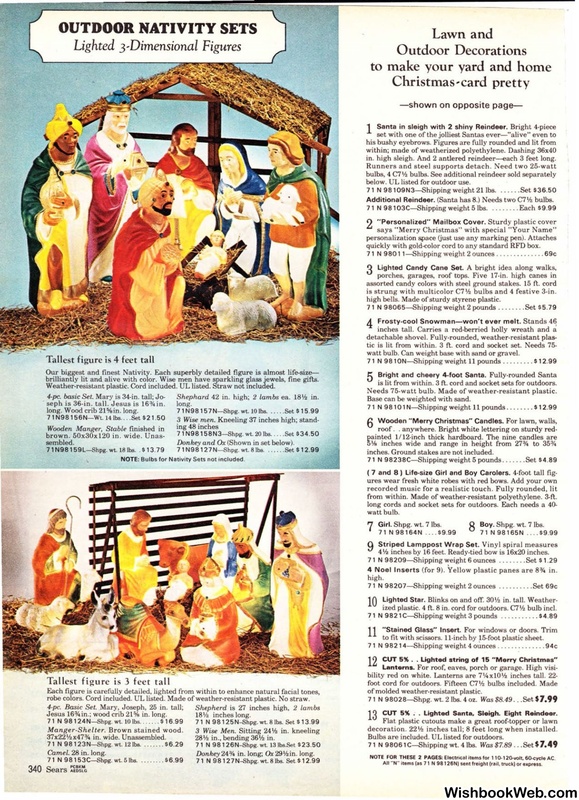 NOTE: Bulbs for Nativity Sets not included. robe colors. Cord included. UL listed. Made ofweather-resistant plastic. No straw. Jesus 16% in. ; wood crib 21% in. long. 7 1 N 98 124N-Shpg. 71 N 9 8 126N-Shpg. below. UL listed for outdoor use. Additional Reindeer. (Santa has 8.) Needs two C7'h bulbs. says "Merry Christmas" with special "Your Name"
quickly with go\d-<:olor cord to any standard RFD box. h bulbs and 4 festive 3-in. high bells. Made ofsturdy styrene plastic. watt bulb. Can weight base with sand or gravel. is lit from within. 3 ft. cord and socket sets for outdoors. Needs 75-watt bulb. Made of weather-resistant plastic. Base can be weighted with sand. inches. Ground stakes are not included. from within. Made of weather-resistant polyethylene. 3-ft. Girl. Shpg. wt. 7 lbs. Boy. Shpg. wt. 7 lbs. inches by 16 feet. Ready-tied bow is 16x20 inches. 4 Noel Insert s (for 9). Yellow plastic panes are 8% in. to fit with scissors. 11-inch by 15-foot plastic sheet. CUT 5% . . Lighted string of 15 "Merry Christmas"
7 1 N 98028-Shpg. wt. 2 lbs. 4 oz. CUT 5% . - Lighted Santa, Sleigh. Eight Reindeer. h inches tall; 8 feet long when installed. Bulbs are included. UL listed for outdoors. 7 1 N 98061 C-Shipping wt. 4 lbs. NOTE FOR THESE 2 PAGES: Electrical items for 110-120-volt. 60-cycle AC. All ..N'' items (as 7 1 N 98 126N) sent freight (rail. truck) or express.